Flyers "get the word out" quickly and with great impact. Whether they are given out at a trade show, passed out in the street or mailed to potential customers; make sure that the quality of the flyer is representative of your company's image. 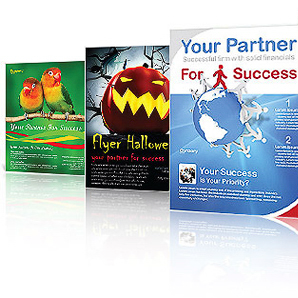 Flyers are not merely printed promotional material but they represent who you are. If you hand out poorly designed and flimsy, cheap-looking flyers, it is highly unlikely that your material will have a positive impact on your clients. On the other hand, a well designed flyer with brilliant colors and quality printing can guarantee your company's image will stand out from your competitors.